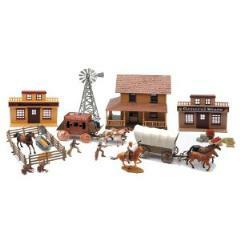 The Big Country Western Town playset from New Ray includes 4 Cowboy gunfighter figures, 6 Horses, Stagecoach, Covered Wagon, and supply crates. Two story country house features a hinged roof and measures 9.25 x 6.5 x 8.5 inches tall. Buildings, wagons and accessories or made from mostly hard plastic. Figures are made from flexible plastic with excellent paint and details. Pieces are approximately 1:32 scale. Great Western Town Playset to add to your collection!